The four-time Olympic gymnastics champion AlekseiNemov will put on a show featuring many sporting legends. The program comprises tumbling, acrobatic stunts, circus acts and dance shows. 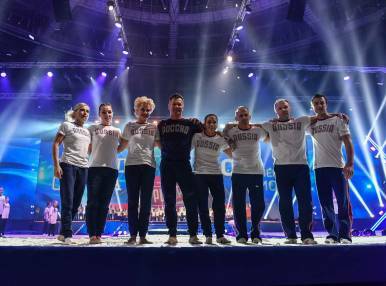 Over 100 best Russian sportsmen will participate in this event, including Karelin and Kabayeva, Utyasheva and Khorkina, Zamolodchikova and Isinbayeva, Kolobkov and Masterkova, Sauti and Svatkovsky, Moskalenko and Popov.